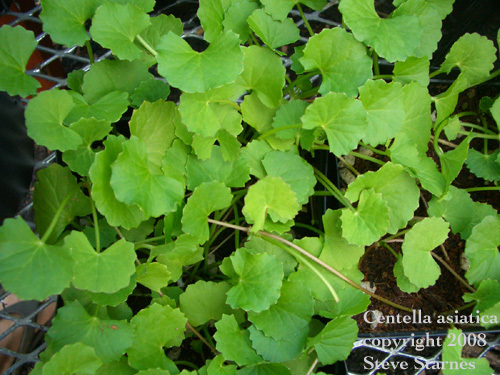 Centella asiatica-Family: Apiaceae. Formerly classified as Hydrocotyle asiatica. Common Names: Brahmi, Gotu Cola. Used in Ayurveda. Fast growing short herb. Puts out numerous runners. Best grown in a bulb pan or other shallow wide pot. Full sun. Keep wet. Copaifera langsdorfii- Family: Fabaceae. Common Names: Diesel tree, copaiba. Trees are tapped for hydrocarbon rich sap that can used as a diesel substitute with apparently minimal processing. Also, used to produce lacquers. Also, resin is reported to have a number of medicinal uses. Native to tropical forest of Brazil. 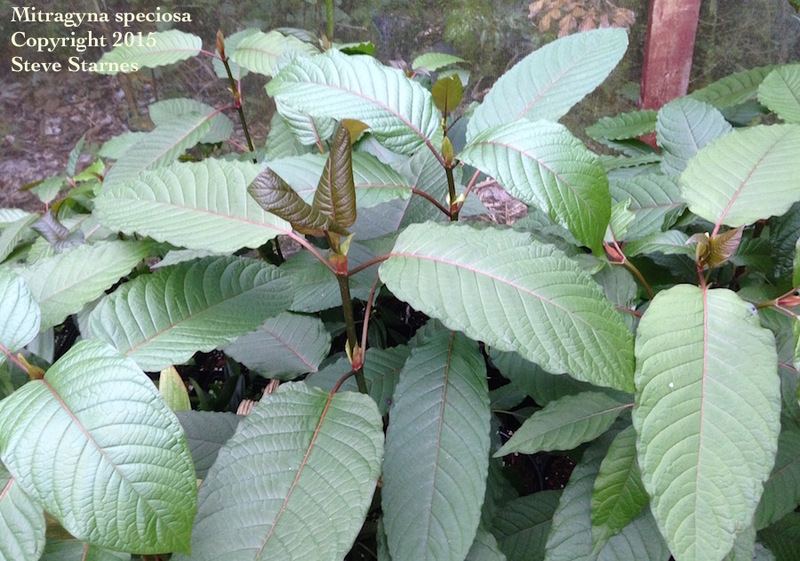 It is not reported to be cold tolerant and can only be grown in the tropics. Growth rates are moderate in young plants. Ultimate height is reported to range from 6 to 35 meters; it likely depends on soil and growing conditions. Gynostemma pentaphyllum-Family: Cucurbitaceae. Common Name: Jiao gu lan. Palmate leaved vine native to southern China. Leaves are used for a sweet tea. Reported to be high in antioxidants and have a rejuvenative effect. Seems to be easy to grow in Hawaii. Vines a bit slow when young but grow fast once established. Grow in partial shade. Slightly acidic soil high in organic matter. Reported to be hardy in Zone 8. Leonotis leonurus- Common Name: Wild Dagga. Sometimes planted as an ornamental due to bright orange flowers. Native to South Africa and hardy to light frost. Leaves are sometimes smoked as a euphoric. Full sun. Keep moist. Growth is fast. Seeds germinate readily. Outdoors in USDA Zones 9 to 11. Spider mites seem to be the major problem in warm humid conditions. Macropiper excelsum- Family: Piperaceace. New Zealand Kawakawa. Large shrub. Leaves are used to make a tea. 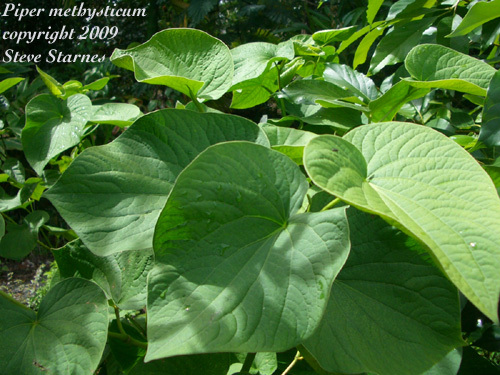 Similar to kava but above ground portions of this species can be used. Seed germination is erratic. Plants are dioecious. Fruit is edible but can have a laxative effect. Reported to tolerate moderate brief frost down to 28F to 29F. Grows best in areas that do not experience extremes in temperature. This species does not thrive in our warm wet environment; so I don't expect to ever be able to provide this species. Ocimum gratissimum- Common Names: Vana Tulsi, Tree Basil. This is a perennial shrub in the tropics. Fast growth reaching 3 or 4 ft. tall in a single season. Similar uses to O. sanctum in Ayurveda. Has a similar clove-like taste but is a bit more pungent. Full sun. Keep moist. Protect from cold temperatures. If you are in an area that has cold winters, keep in a large container and bring into a greenhouse or sunroom before danger of frost. Invasive in Hawaii; so I stopped growing this one. Paullinia yoco- Family: Sapindaceae. Common Name: yoco. Large vine native to tropical rain forest in South America. Stem bark has about 2.7% caffeine and some other alkaloids. Popular among native tribes in the western Amazon. Used as a stimulant. Pinnate leaves emerge bright red and mature to medium green. Young plants seem to prefer light to medium shade. Slightly acidic soil high in organic matter. Very young plants are slow to establish but once they reach about a foot tall they are more robust. Growth becomes fast in the 2nd year. This plant is related to guarana. Piper betel-Family: Piperaceae. Common Name: betle leaf. 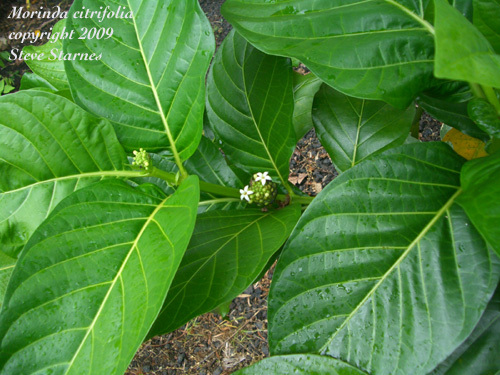 large cordate leaves are used to wrap a mixture of spices and betel nut in India. Meetha pan is a sweet spice mix without the betel nut and tobacco that I prefer. Chewed after meals. In vitro studies have found that the eaves have antioxidant properties. One study found that it prevented ulcers in rats. 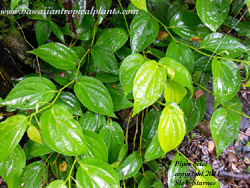 Vigorous woody vine or some varieties can be a scandent shrub. Rich well drained soil high in organic matter. Best in light to medium shade. Support is required for the vine. If conditions are humid, it will send out roots at each node. I have several selected varieties. Most have very strongly scented leaves with a smokey spicy scent when crushed. Yapis cultivar (from Yap island) has larger leaves than the other varieties. 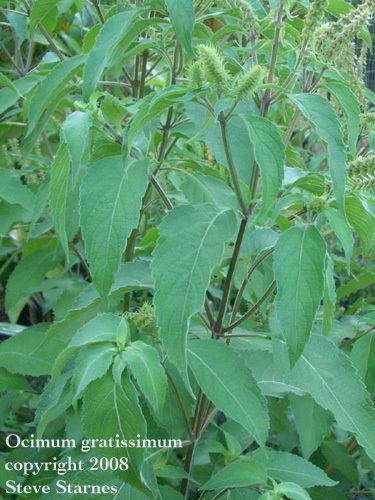 Salvia divinorum- No longer available; we do Not sell this plant. It has been moved to Schedule 1 by the State of Hawaii. Tropical Salvia native to Mexico. White flowers with purple bracts. 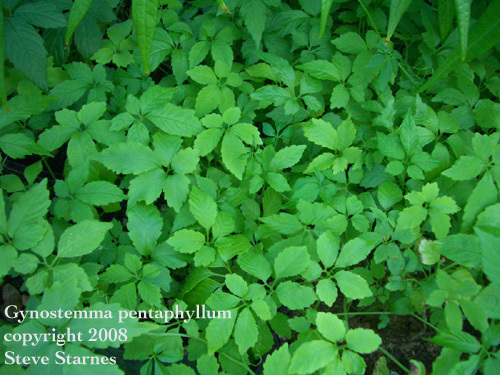 Leaves are large and light to medium green. Syzygium aromaticum- Family: Myrtaceae. Common Name: Cloves. The dried flower buds are the part used for flavoring. Medium tree that begins to bloom at about 6 years old; maybe sooner under ideal conditions. Densely branched. New growth is red. Prefers full sun. Soil high in organic matter. Young plants are slow growing but once they reach about 12 inches tall, they become more vigorous and growth rates become faster. Outdoors in USDA Zone 11. Withania somnifera- Family: Solanaceae Common Name: Ashwaganda. Important ayurvedic herb. Roots are used for their rejuvenative effect. Uses are similar to ginseng. However, it is not botanically related to ginseng. Grows about 2 ft. tall. Produces berries enclosed in a papery husk. Full sun. Well drained soil. Easy to grow. Seeds germinate over several months. Barely covering seeds with course sand so that they are exposed to light speeds and improves germination.